Welcome to the Orange Room! Our Orange Room Program enrolls 8 children each day with two teachers. This classroom provides a small, protective and relaxed atmosphere for older 3-year old children and younger 4-year-old children. Our Orange Room Program enrolls 8 children each day with two teachers. This classroom provides a smaller, protective and relaxed atmosphere for older 3-year old children and younger 4-year-old children. Our focus is to promote the development of social-emotional skills allowing children to learn self-confidence through eventually learned self-help skills; manage in a group setting; and follow the rules and routines of the classroom. Our teachers create a literacy-rich environment through intentionally planned learning opportunities to promote language development as well as physical, cognitive and creative growth. Our schedule allows large blocks of time for free choice play in the classroom along with outdoor play each day. Weekly theme-based curriculum is developed around the interests of the children. Teachers observe and assess each child then use this information to adjust curriculum and play choices offered in the classroom to meet the individual needs of each child. 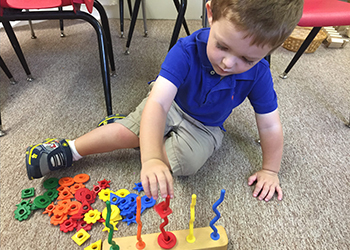 Our full day preschool program includes a rest time followed by a planned afternoon curriculum which offers calm, relaxing play activities. These activities are an extension of the morning curriculum allowing children additional time for exploration and practice of the concepts previously introduced. Children enrolled in this program must be toilet trained. 8:30a.m. to 12:30p.m. Morning snack provided. Children bring a lunch from home. 8:30a.m. to 5:30p.m. Morning & afternoon snack provided. Early morning drop-off available upon request for full day children beginning at 7:30a.m.